May 15th, 2015 - This Double Dry Hopped w/ Simcoe is a special treat from the now dead South Park brew station. Orange and calm, it's a standard looking IPA with a huge Simcoe hit in the nose - great for olfactory training. Soft and with a little nuttiness, urine and wild grass, it's a feral beer and takes a slow steps to approach. The flavor is clean, crisp and mild, and is also clean and dynamic, with a crispy happiness, and sparkles with touches of tarragon and apple. Wow, did not expect this level of greatness from such a high gravity brew. Nice amber color with a short head. The smell is deeply rooted in citrus, pine, earthy, and resinous hopes. Awesome malty aroma, and the taste is an explosion of medium malty bodied citrus notes with a deep bitterness that is likely a 60+ minute boil. The hop schedule is complex but perfectly manicured to this beer. I am so giddy with the quality of this beer that I am trying desperately to pace myself while drinking it. Beware with this beer, it may just captivate you. Best beer I ever had. Sad to see it so long on my distros shelf. Still too expensive despite an east coast brewery colo. Just too good, like what crack sounds like, so I stay away. Dropped those fat concentrated orange image hues. 1/2" off white head. Aroma quite nice, hit the even more pungent than normal dry hop notes. Lots of citrus to this one. Pops citrus and tropical fruits. Taste crushes the tongue with a stratospheric level of bitterness. 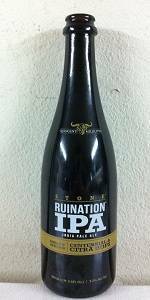 Ruination indeed. Can't really discern anything different in the taste and mouthfeel on this one compared to the base 1.0 version. Stick with the tap version, bottles seem excessively expensive compared (500ml) to when they're in (120z) bottles.